Many staff members today attended a joint extraordinary general meeting of the United Nations staff union and the United Nations Development Programme staff association held in the General Assembly Hall from 8 a.m. until 1 p.m. Three resolutions were adopted. The Union and the Association together have some 5,800 members in New York. The basic issue discussed was the maintenance of two categories of workers - professional and general service - and the differing benefits paid to these categories in such areas as family allowances and home leave. 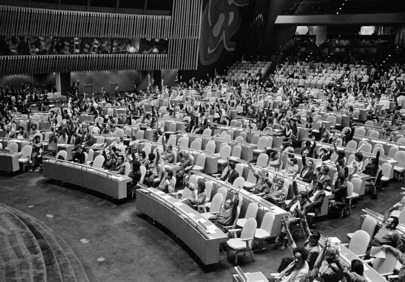 A general view of the meeting as a vote was being taken on one of the resolutions.